I'm not one of those Les Mis fanatics. I first saw it on tour over a dozen years ago, and what I remember most about it is that it was really long. I liked it well enough to buy the soundtrack, which I listen to periodically; the score is gorgeous and includes some wonderful songs. But I've never really connected with it like I have other musicals (I'm more of a RENThead). That changed a little when I saw the movie last year, but that too felt long and a little exhausting. 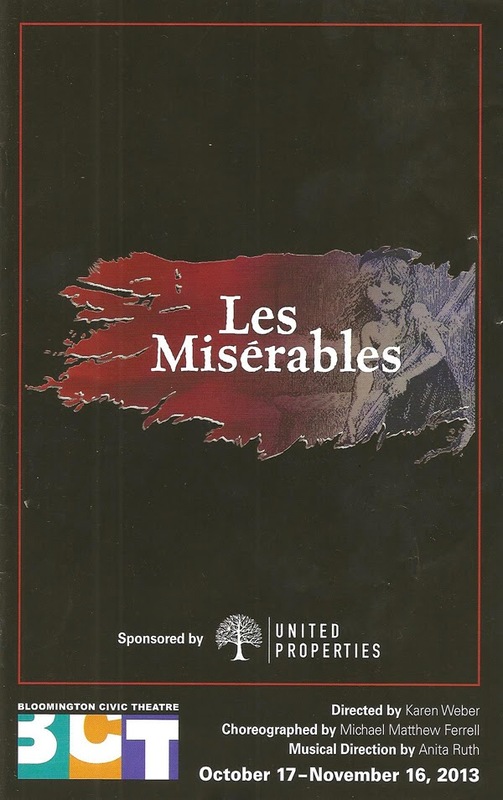 But after seeing Bloomington Civic Theatre's new production of Les Miserables, I finally see what all of the fuss was about. It does not feel long or tedious; every moment is completely engaging. The music soars in the hands of this talented cast of singers and the big gorgeous pit orchestra (Anita Ruth has written some new orchestrations to replace the synthesizers, adding bassoon and guitar and doubling some instruments), and the themes of redemption, forgiveness, and love are so compelling. I've seen just about every musical production at BCT for the last few years and I always enjoy what they do, but Les Miserables is the best thing I've seen there so far. It's absolutely thrilling. In case you're unfamiliar with the theater juggernaut that is Les Miserables, here's a quick primer. 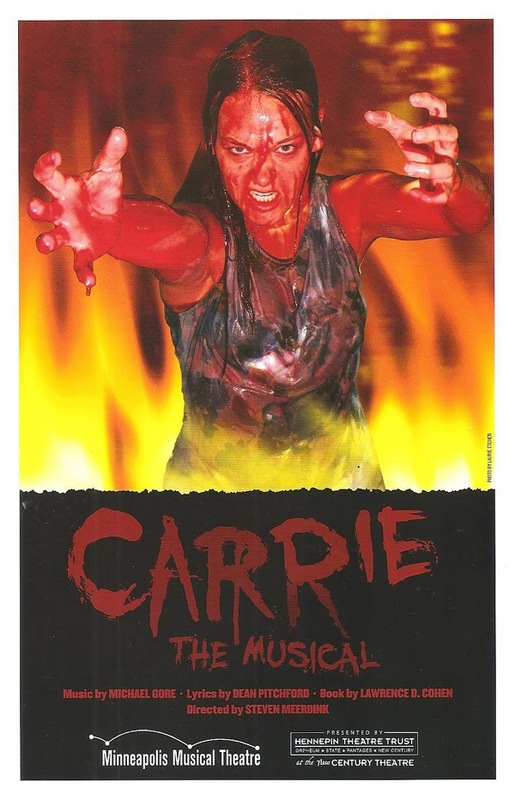 The musical premiered in London in 1985 and arrived on Broadway in 1987, and became one of the longest running musicals in both locations. Based on the 19th century novel of the same name by Victor Hugo, it follows the life of Jean Valjean from the release from his 20-year imprisonment for stealing food, to his involvement in the French Revolution, and many points and characters in between. Always on the run from Inspector Javert, Valjean tries to make a good life for his adopted daughter Cosette while struggling with his past. 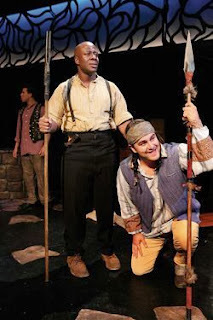 As director Karen Weber (who went back to the original text to inspire the tone of this production) writes in a note in the playbill, "It is a sprawling morality play, set against a tumultuous period in French history. That setting illuminates and encapsulates the suffering and oppression of generations of the French people, the human spirit crying for an end to that suffering, and the desperate measures taken to end it." 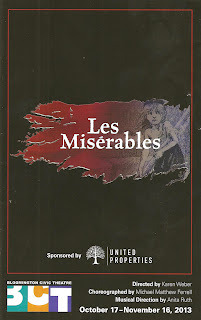 One of the reasons I was so excited to see BCT's production of Les Mis is the cast. As anyone who's read this blog with any regularity knows, I'm a big fan of Dieter Bierbrauer, and have been since I saw him play Tony in West Side Story at the Chan years ago. I will see him in anything (even a musical that takes me back to the 80s, my least favorite decade), and I love seeing him in iconic musical theater roles like Jean Valjean, the troubled hero of Les Miserables. In addition to Dieter's typically perfect vocals, this is a very physical performance as he transforms from a young man beaten down by years in prison, to a respected businessman, to an aging man who walks like he's lived long and suffered much (but can still easily sling a young man across his shoulders). He carries the character's suffering in his body and his voice. "Bring Him Home" is a highlight, so beautiful and heartfelt. I didn't think anything could top hearing Dieter sing "Being Alive," but this just might have. Of course Dieter is not the only star in this show. There are so many characters who have great moments in song, and BCT has chosen the perfect actor for each one. William Gilness is a great adversary as Inspector Javert, strong and unmoving in his goal to find Valjean, until Valjean shows him mercy and he is unable to process it and doesn't know how to go on with life. Laurel Armstrong beautifully embodies the tragedy of Fantine. The talented Aly Westberg is an incredibly sympathetic Eponine, another tragic character, and her "On My Own" is another highlight. Riley McNutt has a strong voice as Marius, with Molly Jo Hall as his lovely Cosette. Carl Shoenborn and Sally Ann Wright are entertaining as the comic relief innkeepers. Dominique Wooten is magnificent in a scarlet jacket; his cries to war make me want to climb a pile of rubble and wave a red flag! From the oldest to the youngest, this cast brings these characters to life. In a post-show discussion, Karen said that she told her cast that it's not enough to sing beautifully (as they are all capable of doing), but they also need to tell the story in a compelling way. Mission accomplished. Once again, Michael Hoover designed a functional and appropriate set. Stairs to a balcony provide many levels on which Karen effectively places the action. A rotating center piece allows set pieces to enter and leave the stage smoothly, most effectively the barricade in the second act. As it spins we see both sides of the barricade. Costume designer Ed Gleeman has dressed the cast in period clothing both desperate and opulent. Mary Todd Lincoln, the wife of President Abraham Lincoln, has a reputation in American history as being difficult and, well, somewhat crazy. Last year's hit movie Lincoln gave us a more sympathetic portrait of this woman who not only lived in the public eye during the Civil War, but also suffered the deaths of three of her four sons and her husband. 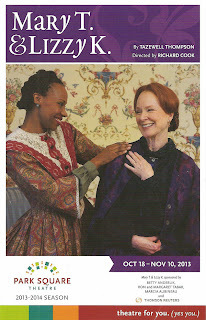 The new play Mary T. and Lizzy K. by Tazewell Thompson gives us yet another view of this fascinating woman through her friendship with her seamstress Elizabeth Keckly, a former slave who bought her freedom and became dressmaker for the most famous woman in America. It's a small and intimate play, with just four characters in a room talking (we also meet Lincoln and Lizzy's young assistant). But through the performances of these four wonderful actors, the world of the Lincolns is brought to life for a short time on the Park Square stage. 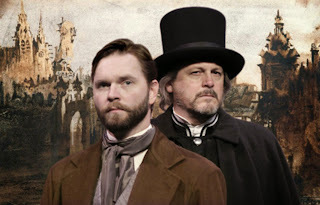 The play takes place on the day of Lincoln's assassination, when the couple is planning a trip to the theater, unaware of the real tragedy that awaits them at Ford's Theatre. 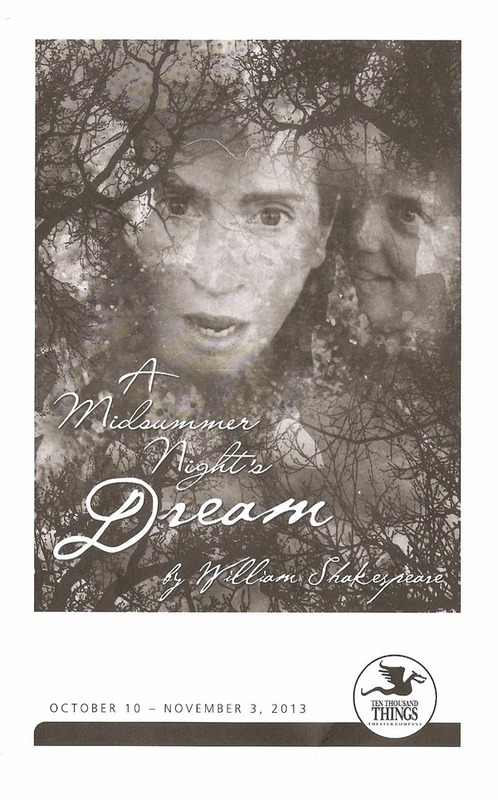 The play also flashes forward to when Mary is institutionalized by her son and receives a visit from Lizzy, who was written a book about their time together which has angered Mary. But on that day in 1865, things were relatively happy. 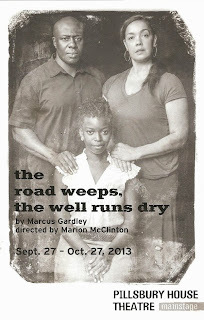 Lizzy (another strong performance by Shá Cage) is making a new dress for Mary (Linda Kelsey, beautifully portraying the range of Mary's emotions and moods), with the help of her assistant, the eager young Ivy (Nike Kadri, shining in the light-hearted moments of the youth and sympathetic in her stories of abuse). Abe (Stephen D'Ambrose, with a quiet dignity and congeniality) stops in to visit his wife. They are still mourning the death of their son just a few years earlier, and dealing with the aftermath of the Civil War which has only recently ended, with great cost to both sides. There's a genuine love and affection between the two of them, despite the fact that Mary flies off the handle at the slightest provocation, met with kindness and understanding from her husband. Lizzy tells Ivy to ignore these incidents and continue her work. Lizzy is Mary's friend and confidante, but the relationship is not without its problems. Mary has not paid Lizzy for any of her work, and Lizzy has in turn not paid Ivy. Ivy, who has suffered greatly in her time as a slave, insists that Lizzy pay her with her cloak and hat, so that she too can feel the pride of being a free person who is paid for her work. All four of these distinctly drawn characters have a story to tell. The set (the third one designed by Michael Hoover that I've seen in as many weeks) is simple and effective, with four stately columns and four tall panels with a door in each, and just a few chairs and tables in the space. Extras in period clothing open and close doors, cover furniture, and make other slight changes in arrangement to signal the change of time and location. Clothing is a central part of this play, and the costumes (by Merrily Murray-Walsh, who also designed the costumes for the original production at the Arena Stage in D.C.) live up to that importance. In the first act Lizzy and Ivy construct a dress before our very eyes, placing and pinning pieces on Mary, beginning with a large hoop skirt. The finished work is even more impressive, as are all of the dresses, shawls, cloaks, hats, and suits we see on stage. Mary T. and Lizzy K. is a fascinating look at a pivotal time in American history through the eyes of four characters (three of them based on real people). You, too, can enter the world of the Lincolns from now through November 10 at Park Square Theatre in St. Paul. Mary T. & Lizzy K. from Park Square Theatre on Vimeo. Since I'm a Guthrie season subscriber (this is my 11th season), I just go when they send me, which for Uncle Vanya happened to be in its final week. There was not a big crowd on Tuesday night (I think the opening of the fantastic Tribes has overshadowed it), but those who were there seemed to enjoy it, including me. I've never seen a Chekhov play (not counting a production of The Seagull over 20 years ago of which I have zero recollection, even though it was my first ever Guthrie show), and honestly when I think Russian literature my first reaction is... ugh. But a few minutes into the show I realized Uncle Vanya is not at all intimidating or fomidable or dry; this adaptation by Irish playwright Brian Friel is a very accessible telling of a bittersweet story, a mixture of laughter and melancholy. With a charming set and the usual fantastic cast of Guthrie favorites and a few newcomers, I found it to be quite enjoyable - a bittersweet, melancholy, funny, thoughtful, and insightful play. 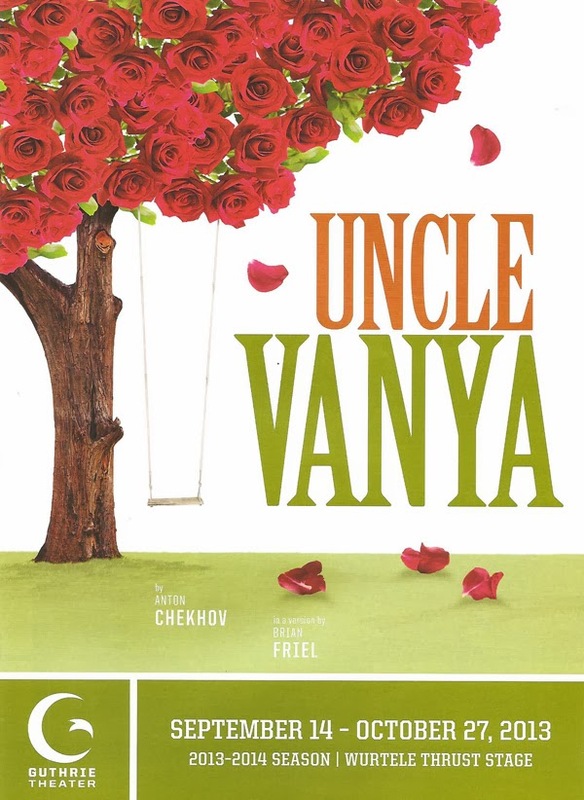 Set in late 19th century Russia, Uncle Vanya tells of a group of relations living on a country estate. Sonya (Emily Gunyou Halaas) and her Uncle Vanya (a charmingly befuddled Andrew Weems) work the estate that she inherited upon her mother's death years ago. Her ill and aging father Alexander (Robert Dorfman) has returned to the estate with his new young wife Elena (Valeri Mudek), and has plans of his own. Also living at the estate are Vanya's mother Maria (the legendary Melissa Hart, making the most of a small role), the nanny (Barbara Kinsley, so memorable in August: Osage County at Park Square a few years ago, here creating another distinct character), an eccentric family friend nicknamed Waffles (the always fantastic Jim Lichtsheidl), and occasionally the town doctor (John Catron, with another great drunken scene). 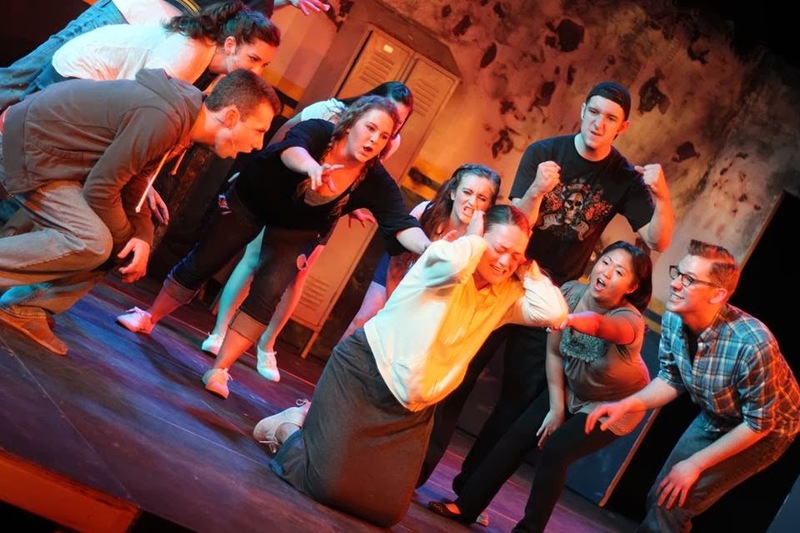 It's a diverse group of characters who interact with each other, having conversations in small groups or alone on stage, talking directly to the audience. 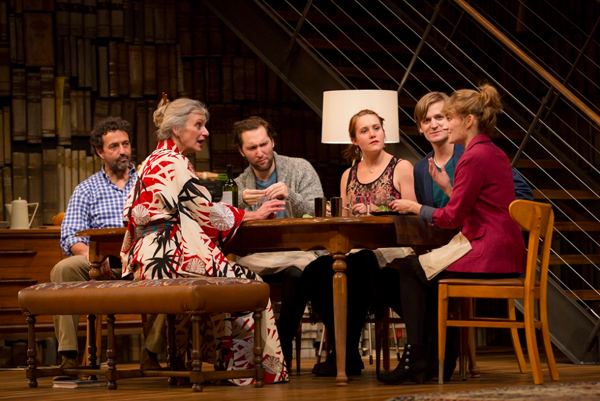 Not a lot happens in the play; it's more of a study of life through these characters. The doctor is an environmentalist and talks about the destruction of the forests and the ecosystem in a way that has become scarily real in the 100+ years since the play was written. Poor Sonya is blissfully in love with the doctor but he's completely unaware of her. Everyone falls in love with the married Elena; she leaves many broken hearts in her wake but is not unsympathetic herself. Alexander mourns his exciting life as a famous professor that is now largely behind him, and Vanya struggles with the drudgery of every day life with no excitement or happiness. The play ponders such ideas as: What does it mean to be happy? Why are some people destined to live happy and full lives while others don't? Why do some women have all the men fall in love with them while others must toil away on the family farm? No clear answers, but we must endure! 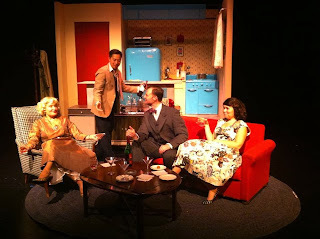 The charming set was designed by Michael Hoover (who seems to be the busiest and definitely one of the best set designers in town); it looks like a life-size dollhouse. Three different rooms in the house are distinctly created in exquisite detail - the front porch, a living room, and a bedroom. Two of the sets are split in two and move in from either side to join in the middle. It's a delight to watch. Uncle Vanya closes this weekend, so you only have a few more chances to see this lovely production of a classic. I'm looking forward to seeing the final play in the Guthrie's 2013-2014 next summer - the recent Broadway hit Vanya and Sonia and Masha and Spike, a sort of modern twist on Uncle Vanya. That's some pretty clever season programming. In the continuing musical theater history seminar that is the Ordway's Broadway Songbook series, today's lesson is on the musicals of the 1950s. Often referred to as the "golden age" of musicals, the 1950s saw the musical expand and grow as an art form, as well as influence pop culture and music. Songs from musicals were recorded by the top musical artists of the day and were heard on the radio. 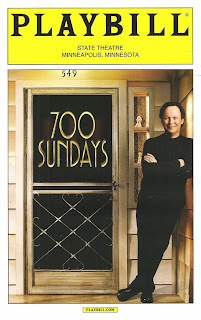 Many musicals from the 1950s are still frequently produced today* and are among the most beloved. 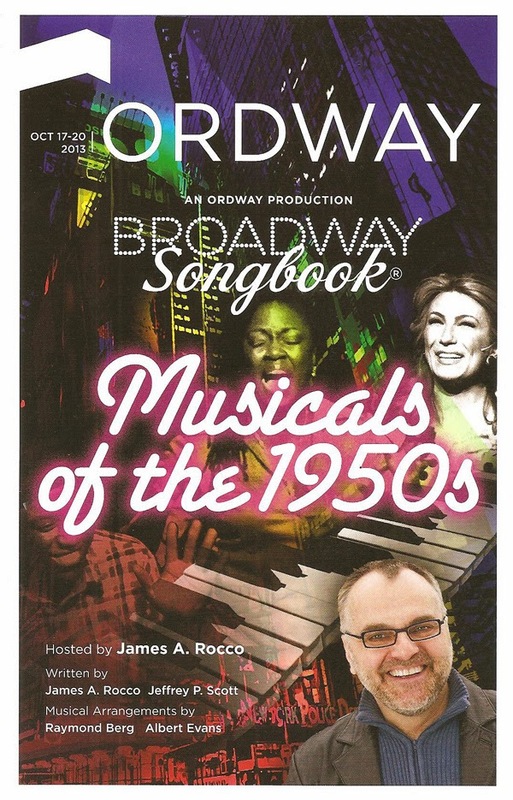 With legendary creators such as Rodgers and Hammerstein, Irving Berlin, Leonard Bernstein, and Loesser and Loewe, Ordway Producing Artistic Director and writer/host of the Songbook series James Rocco had hundreds of fantastic songs to choose from. He's made some great choices and assembled them into a narrative about this musical decade, along with Ivey-winning Music Director Raymond Berg on piano. Many of the musicals featured in the show are very familiar to me, some I've only heard of, and some "hidden gems" were previously completely unknown to me. That's what I love about the Broadway Songbook series - I learn so much about musical theater history, relive some of my favorite shows, and get a taste of shows I've never seen or heard of before. 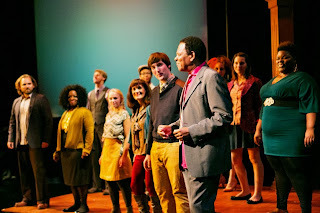 Assisting Professor Rocco in this musical history lesson are six fantastic singer/actors - three Songbook vets (Joel Leistman, Jennifer Baldwin Peden, and Kersten Rodau) and three newcomers to the series (Dan Beckmann, Wes Mouri, and Sara Ochs). They bring to full life the lessons James gives through their performance of these classic songs. The long and expansive opening medley that includes snippets from Damn Yankees, The Music Man, West Side Story, Guys and Dolls, Sound of Music, and a singalong to "Getting to Know You" from The King and I.
Joel singing that great sociology lesson "You've Got to be Carefully Taught" from South Pacific. A couple of classics in Sara's beautiful voice - "Shall We Dance" from The King and I and "Never Never Land" from Peter Pan. An entertaining and fully acted poker game to the song "Politics and Poker" from Fiorello. A medley from Candide, which I didn't previously know much about but am now intrigued by after hearing the clever and lovely songs. Words James used to describe it include "brilliant," "enigmatic," "exhausting," and "influential." I've gotta see it. A medley from Guys and Dolls, "one of the greatest musicals," with Jennifer as a very entertaining Adelaide (she's got great comedic timing to go with her incredible voice). The men performing "Lida Rose" from The Music Man in classic barbershop quartet harmony. Several selections from one of my personal favorites, West Side Story, with Kersten and Jennifer dueting as Anita and Maria, and Dan as an excellent Tony. An adorably enthusiastic Wes singing "I Met a Girl" from Bells are Ringing. Back to back lovely songs by Jennifer - "I Wish It So" from the little-known Juno and "I Could Have Danced All Night" from My Fair Lady. Kersten belting out "Everything's Coming Up Roses" from Gypsy. The closing number - "Climb Ev'ry Mountain" from another favorite, The Sound of Music, a song that never fails to give me chills. Peter Pan was originally written for television. Oklahoma is considered to be the first musical as we know it, with songs fully integrated into story, and became the template for musicals through the 1970s. Fiorello is one of the rare musicals that won the Pulitzer Prize for drama (although I should have remembered that from The Newsroom). Our own Sir Tyrone Guthrie directed the original production of Candide on Broadway. Frank Loesser (Guys and Dolls) mentored Meredith Wilson (The Music Man). The Music Man beat West Side Story for the Best Musical Tony in 1958, and Fiorello and Sound of Music tied for the Best Musical Tony in 1960, beating Gypsy (can you imagine a year in which two or three of these classics debuted?). For the last two seasons, Broadway Songbook has been performed in the Ordway's McKnight Theater. But since the McKnight has been replaced by a hole in the ground, the show has been moved to the Ordway's main stage in a creative way. In order to maintain the intimate feel of the smaller McKnight Theater that works so well with the Songbook series, the show is set up at the back of the huge stage, with audience seated in chairs right on the stage. It's a really cool experience to be on that stage and look out at the empty house. However, the sight lines are not great, with twelve rows of seats on the same level and the stage area only raised a few feet. If they performed at the front of that big stage, with a curtain dropped to make the stage shallow, and only seated people in the front section of the house, it would maintain the intimate feel and eliminate the need to bob one's head around the guy sitting in front of you. But they're making the best of a less-than-ideal situation. *Two musicals featured in this Broadway Songbook will be produced by local theater companies next year. Ten Thousand Things will bring their signature stripped-down-bare-bones-straight-to-the-heart style of theater to The Music Man early next year, and Bloomington Civic Theatre is doing Gypsy next spring. James also said that he's hoping to reimagine Damn Yankees on the Ordway stage sometime soon. This is another musical I'm not familiar with, but as a Twins fan I'm very familiar with the phrase "damn Yankees!" 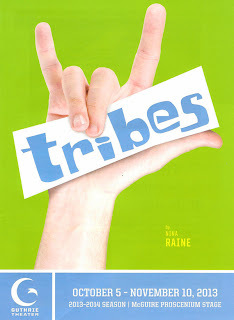 The new play Tribes, by British playwright Nina Raine, is about nothing less than the nature of love, family, language, words, books, emotions, music, and the interaction of all of these things. The framework in which these issues are explored is a dysfunctional family with three adult children, one of whom was born deaf, all living with their parents in North London. The deaf child never learned to sign, and instead learned to read the lips, faces, and bodies of his family. But still, the nuances of their boisterous interactions are lost to him. He meets a woman who grew up hearing in a deaf family, but is slowly losing her hearing. This introduction to the deaf community opens up a new world to him and makes him look at his family differently, with devastating results. While the element of deafness vs. hearing and the use of sign language (with surtitles to translate) is a fascinating element of the play, at its heart is a very real and human story of belonging and finding your place in the world, and how to navigate that journey within the family you were born into. Tribes is an excellent play and the Guthrie has assembled a stellar cast, which makes for a completely absorbing night at the theater. This is the first play I've seen of the Guthrie's 2013-2014 season (I see Uncle Vanya next week), and judging by this example, it's going to be an extraordinary season in the big blue building on the river. Billy has returned home from university to live with his parents, both authors, and his older brother and sister who are both trying to find their way in life, to "find their voice." This is a family that shows its affection through arguing with and insulting each other (something those of us coming from "Minnesota nice" families may not recognize). Siblings Dan and Ruth pick on each other relentlessly, and father Chris is constantly haranguing his children and their life choices. The opening scene of the play is one big long argument over dinner, with Billy sitting quietly, occasionally asking what's going on, and being told "it's nothing." He's alone in the storm that is his family. Perhaps for this reason everyone loves Billy the best, but maybe they don't really know him. He meets Sylvia at a party, a woman who's fluent in sign and dealing with slowly losing her hearing, and is instantly smitten by her and the deaf community he has so far avoided. He learns to sign and becomes a part of this community, at the same time Sylvia is longing to leave it for the bigger world. Billy decides to stop talking to his family until they make the effort to learn sign language for him. He tells them he doesn't feel like he belongs, and he doesn't need them anymore. Billy is finally fully able to express himself, and everything he's been holding back his whole life comes out, and it's absolutely devastating. This play lulled me into thinking it was a sharp and acerbic comedy, and then the second act delves into these deep and painful issues like a knife to the heart. The exploration of the idea of language and how that relates to feelings is fascinating. At one extreme is the family patriarch, a retired professor and author who believes that you can't feel something unless you have the words to express it. And therefore, he believes that people who speak in sign language are somehow shallower than people who use spoken words. Ruth is an aspiring opera singer trying to "find her voice," who believes that the music itself expresses emotions even without words. Signing is like music, and is as beautiful as poetry. It can also be harsh and ugly, as when Billy lets loose his pent-up feelings. He tells his father this is the first time he's really listening to him, and it's because he stopped speaking. 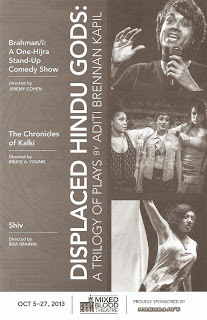 This is the kind of play that's so full, I wish I had time to go back and see it again to let it soak in more completely. This six-person cast is a dream. Most of them are known and beloved to me from their work on the Guthrie and other local stages, along with two cast-members making their Guthrie debut - one of those accomplished soap/theater actors, and a deaf actor who so completely embodies his character physically and emotionally. At the head of this crazy family is Stephen Schnetzer, who is best known for playing Cass Winthrop on Another World for many years (and whom I know for taking that character to my beloved soap As the World Turns when AW went off the air). But he's also an accomplished theater actor (as many NYC soap actors are), and he's fantastic on stage. He's so good at playing this selfish, arrogant, egotistical man that I almost wanted to boo him at curtain call! Matching him as his wife Beth is our own beloved Sally Wingert, who makes the most of every moment (I particularly enjoyed Beth's befuddlement while answering her cell phone), and also conveys the deep love for her very different children in the midst of the craziness. Anna Reichert and Hugh Kennedy are so great as the bickering siblings, walking the fine line between spoiled brat and sympathetic young adult. Hugh Kennedy absolutely ripped my heart out. His character is so mean to his sister and parents in the first act that you wonder why he is so mean, and soon learn that his attitude is covering a deep sensitivity and mental illness. By the end of the play his childhood stammer and the voices in his head have returned, and he wears a slouchy sweater like armor around his wounded soul. Tracey Maloney has the Herculean task of speaking in several languages - sign, spoken English, and the high-pitched and slightly broken English of someone who can no longer hear their own voice - and she does it all beautifully. Last but certainly not least is John McGinty as Billy. The most powerful moment of the play is when Billy finally finds his voice and tells his family that he feels left out. It's devastating, but in John's hands it's a thing of painful beauty. When he begins signing is when his acting finds depth. I know you're already saying to yourself, "I've got to see this play!" But just wait, I haven't told you about the set yet! And what an incredible set, unlike anything I've ever seen. The three walls of the family's living space are covered floor to very high ceiling in books, like some giant library. It's the kind of room I'd like to be trapped in for days, weeks, months, and just escape from the world into the world of books (which is what several members of this family do). The wood floor curves over the end of the stage and spills into my lap in my front row seat of the proscenium theater. The large space is filled with a dining room table, couch, a few chairs, and a piano (used to beautiful effect). A party scene and a bedroom are achieved by the lowering of a wall and the entrance of a table or bed. This is a play that would be brilliant on a bare stage, but the addition of this wondrous set by Alexander Dodge takes it one step further. Tribes continues on the Guthrie's Proscenium Theater stage through November 10. I highly recommend it. Yes, I'm a big fan of the Guthrie (this is my 11th year as season subscriber) and enjoy pretty much everything they do, but this is one of the best plays I've seen there in quite a while. My favorite play of last season was Clybourne Park, and this reminds me of that in the harsh and real way it opens up issues. But this I think has more heart to it. It's emotional and thought-provoking, beautifully written and acted. In short, it's everything I want a play to be. We long for "the good old days," when things were simple and everyone was content, before the busyness and technological craze of the modern era. We admire the idyllic lives of the Cleavers or Ozzie and Harriet. But what would happen if we really could return to those days? Would we find them as wonderful as they seem? 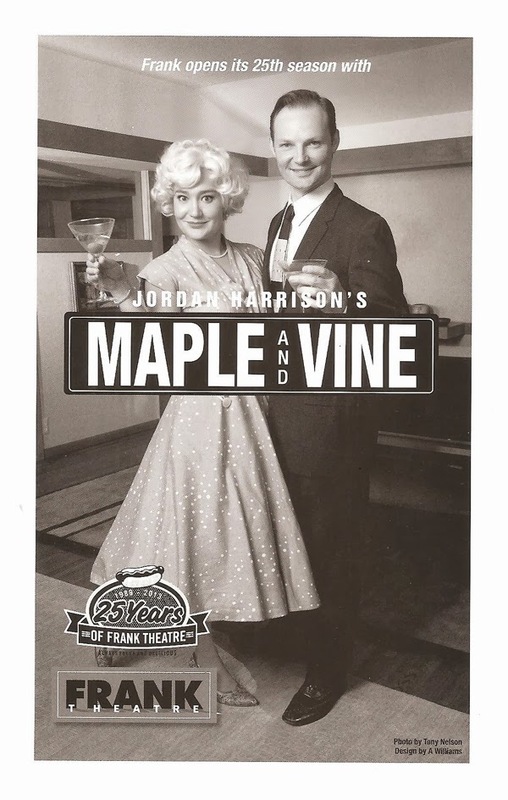 The new play Maple and Vine, which opens Frank Theatre's 25th anniversary season, explores that very idea. People from the modern world leave it to live outside of society in a world that's patterned on 1955, trying to achieve "authenticity" in everything from the food they eat to the racism specific to the time. As you can imagine, it turns out that the good old days are not exactly as simple and happy as we like to imagine. 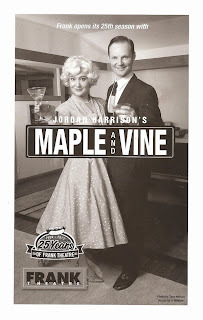 What the exquisite TV show Mad Men does for the 1960s, Maple and Vine does for the 1950s - dig beneath the shiny happy veneer to reveal the repression and unhappiness that lie underneath. Katha and Ryu are a typical American couple, busy with their careers and hectic modern life. They've recently suffered a loss and are struggling with regaining their footing in their lives. When Katha meets a man in a sharp suit and hat who tells her about a place where life is simpler, she's intrigued. She convinces her reluctant husband to move to the Society of Dynamic Obsolescence (SDO), where he trades his job as a plastic surgeon for a position making boxes at a factory, and she trades her business suits for an apron. Katha, now called Kathy, seems to flourish in this environment as she revels in going to society meetings and making crab puffs. But Ryu, who is of Japanese heritage, struggles with the "period appropriate" racism and conflicting feelings about the "recent" internment of Japanese Americans, as well as his own conflicting feelings about his new role as "head of the household." As chief recruiters for the SDO, Dean and Ellen provide a perfect example of life in 1955, until secrets come to light that reveal they're not what they seem. Are Katha and Ryu ready to take over for them and make a life in this new old world, despite their reservations? 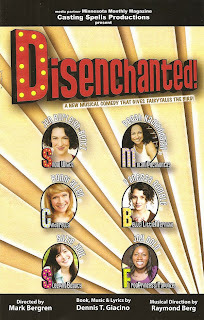 As usual, Frank Theater has assembled a sparkling cast. Tessa Flynn and Sherwin Resurreccion are believable and relatable as Katha and Ryu, the couple through whom we're introduced to this bizarre world. Because of their dissatisfaction with the world and their life, it's easy to empathize with them and understand why they might fall victim to this too-good-to-be-true scheme. As Dean and Ellen, Wade Vaughn and Katie Guentzel project the perfect glassy-eyed veneer of the happy couple as they provide tips to their new recruits, and also give us glimpses of what's going on underneath. Rounding out the cast is David Beukema, in a sympathetic turn as a man with a past (and current) connection to Dean. doesn't this look like a party you'd like to join? Only two more weekends to catch this intriguing new play. Frank is again also offering free readings of plays by playwright Jordan Harrison during the run of the show; see their website for info about both. We live in the media age, with the proliferation of the internet, Facebook, Twitter, and 24-hour cable news channels. Or at least that's what we believe. But the musical Baby Case, receiving its regional premiere at the History Theatre, shows us that 80 years ago the media, and its customers the American public, were just as celebrity-crazed, crime-obsessed, and scandal-hungry as we are today. The only thing that differentiates the current "media age" from past ones is the format, frequency, speed, and availability of the media. In 1932, the celebrity was famed aviator Charles Lindbergh, and the crime was the kidnapping of his 20-month-old son. This "crime of the century" and subsequent trial of the man accused of committing it stirred a media sensation very similar to what we see today. The media and the American public's reaction to the crime and its effects on the people involved are the subject of the musical, rather than the crime itself. 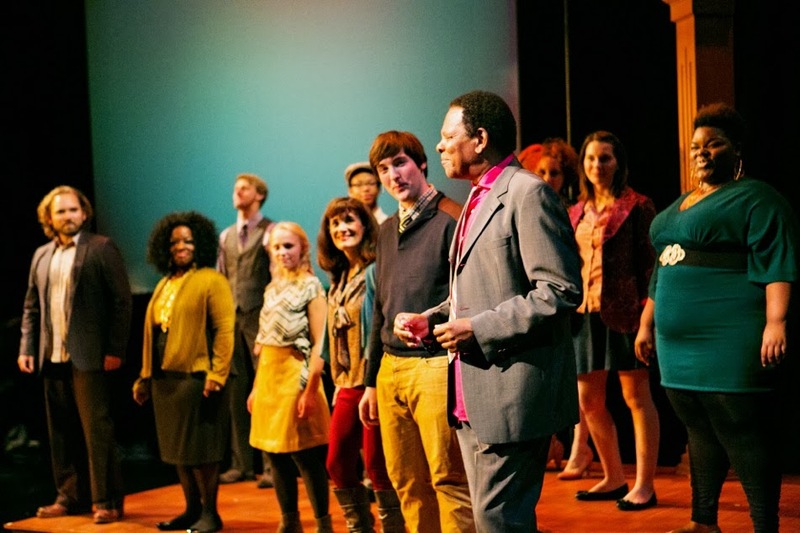 Baby Case is a fascinating and fantastic original musical that explores the ideas of fame, crime, and the relentless obsession of the media, told through music in a classic musical theater way. The musical begins with establishing Lindbergh as a celebrity and a reluctant hero, and quickly progresses to the disappearance of Charles Jr. from his nursery one night. The first act deals with the search for the baby and the kidnappers, and the sad conclusion to the former search. In the second act, Bruno Hauptmann is accused and tried two years after the crime, with the primary evidence being possession of bills from the ransom money. The media interferes with all of this, as do Lindbergh's famous and powerful friends (including president Hoover). It's a tragic story with no happy ending for anyone, except perhaps for the newspapers. All of this is told beautifully and powerfully through song, with little spoken dialogue. It's a traditionally structured musical, with big ensemble numbers ("Hauptmann Murdered the Lindbergh Baby!") and quieter moments of internal reflection ("Lullaby," "Over the Sea"). 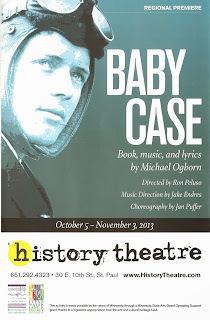 Baby Case proves that you can make any story into a musical, if done right, as this one is. It's funny, moving, entertaining, informative, relevant, thought-provoking, and with tunes you will leave the theater humming. The 11-person cast is wonderful across the board, all of them playing multiple characters. Peter Middlecamp and Kendall Anne Thompson play both couples at the center of the story - the Lindberghs and the Hauptmanns (the man convicted of the crime and his wife, who devoted her life to clearing his name). They have great chemistry as both couples, and both Peter and Kendall have beautiful voices and really bring out the complicated emotions of their characters. In the second song of the show (the moment I knew this was going to be a good one) they form a powerful trio with Kym Chambers Otto as the Nurse who discovers that the baby is missing. Other standouts in the cast include Jon Andrew Hegge, transitioning between famous radio gossip Walter Winchell and a judge with a deft turn and removal of a hat; Gary Briggle as the man who facilitated the ransom delivery, the questionable defense attorney, and Phil Donahue; Emily A. Grodzik as an accused servant and Ginger Rogers; and Paul R. Coate, providing a bit of comic relief as a lady socialite duped into paying ransom money to con artists. The production elements are also all top-notch. The Hooverian set is simple, efficient, effective, and evocative, with newspapers in the background reflected in mirror image on the floor, as well as a ladder and fireman's pole for easy movement to the second story area. The wardrobe by E. Amy Hill reflects this color palate of yellowed newspapers - black, white, tan, neutrals, with pops of red or maroon and nary a green or blue to be seen. Lovely period clothing and a fabulous aviator jacket that makes me want to find one for myself (in faux leather of course). Jake Endres leads the sparse four-piece orchestra, just off stage, through this great music. 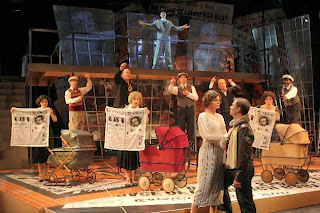 Baby Case is a promising new musical (it was a hit at last year's New York Musical Festival) with shades of Ragtime (the first "Crime of the Century! "), Floyd Collins (another early 19th century media circus), even Next to Normal (mourning the loss of a child). In the second act I had flashbacks to another musical on that very stage - the Theater Latte Da/MN Jewish Theater co-production of Parade, about another man falsely (?) accused of the murder of a child. This is not to say Baby Case is derivative; it's an original creation that fits well in the musical theater anthology. If you're a fan of musical theater, you should not miss this fantastic production of a great new musical (playing through Nov. 3 at the History Theatre in downtown St. Paul, discount tickets available on Goldstar). I'm a Minnesota girl, but unlike Madde Gibba and Emily Schmidt, I've never wanted to live anywhere else. These two local theater/comedy artists have recently moved to the East and West Coasts, respectively, to find their fortunes. But they still have strong roots in and love for their home state, and returned for a one-night-only performance of their new sketch comedy show What's A Ocean? at the Bryant Lake Bowl. * And even though comedy is not my main interest (I'm in too deep with the theater scene to go too far into the comedy world; I do like to have one or two nights off a week), I really enjoyed Madde's Fringe show Dear Madde, and What's A Ocean? sounded like a fun concept, so I went, and really enjoyed it. Madde and Emily have written a series of short two-person sketches about their new respective hometowns - NYC (aka the greatest city in the world) and L.A. (never been, and have no desire to go). The show opens and closes with a witty voiceover explaining the situation, and they make nice use of voiceover and video in several of the sketches. Topics covered include the juicing craze, calling home obsessively, the dangers of nannying, the stress of traveling in L.A. (traffic) and NYC (subway), a hippie cafe called "Cafe Gratitude," meeting old friends at a party and telling them about your new life, and my favorite sketch - online dating (using scarily real profiles). Madde and Emily also each read a humorous piece they'd written, Madde about life in Brooklyn, and Emily a letter to her future daughter. Madde and Emily are two funny and talented Minnesota women and I wish them well in their new homes on the Coasts. But I also hope they continue to come home to Minnesota on occasion to share their talents with us! *I had never been to the Bryant Lake Bowl before, although I'd heard about it and walked past it during Fringe week. It's a cute little theater at the back of a restaurant and, yes, bowling alley. Something to note for next time - food and bar service at your seat! Labels: Bryant Lake Bowl, Comedy, Emily Schmidt, Madde Gibba, What's A Ocean? If watching a Disney princess movie has ever left you feeling let down, betrayed, dismayed, frustrated, or downright pissed, Disenchanted is just the cure you need! 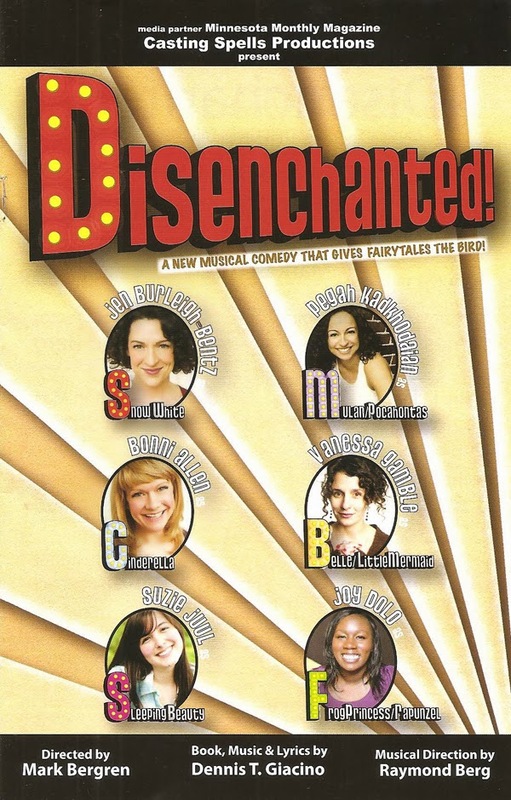 In this new musical comedy by Dennis T. Giancino, the Disney princesses are allowed to tell their true stories about what living in a Disney fairy tale is really like, and what happens after the "happily ever after." Featuring catchy and melodic tunes, clever and funny lyrics, and a stellar cast, it's a really fun and fantastic 90 minutes! But hurry - there are only six performances left at the Ritz Theater! The host of the evening is the sharp and bitter Snow White (a dynamic and commanding performance by Jen Burleigh-Benz), like you've never seen her before. Her back-up princesses are the ditzy Cinderella (a very funny Bonni Allen) and Sleeping Beauty (the always delightful Suzie Juul, with a voice as clear as a bell). They introduce us to the "P.C." problem - the princess complex - in which girls are taught they need to be pretty, simple, and obedient while they wait for their prince to come and save them. 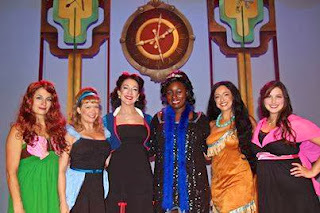 These princesses will cure you of that notion! Mulan (Pegah Kadhodaian, excellent in this and her second role as Pocohantas, a historical figure turned pin-up girl) makes an appearance and tells us "maybe I'm a lesbian" since she's the only princess who doesn't get the prince. Rapunzel is an angry German princess who won't accept her Disney transformation, and the Frog Princess is "the princess that's finally gone black" (Joy Dolo in both roles). We also meet an insane Belle and a drunken Little Mermaid (a scene-stealing Vanessa Gamble). The princesses lament about body image, dieting ("All I Wanna Do Is Eat" is a highlight), housework, and the commercialization of their image. In the end they declare that those days are "Once Upon A Time," and they're finally free to be themselves! Friends, this is a really great show. Fun and original, turning fairy tales on their head, sung in solos and gorgeous harmonies by six talented women, tongue in cheek, a cast that's so comfortable in their roles and with each other, Ivey-winning Music Director Raymond Berg in perfect musical conversation with the cast, costumes by A. Emily Heaney that are a modern take on princess attire (my favorite: Snow White's dress! ), performed in a kitschy old theater, and only 90 minutes long so it's short, sweet, and to the point, leaving you wanting more rather than outstaying its welcome. Catch it this weekend while you still can! 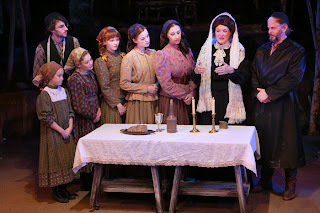 Chanhassen Dinner Theatres' new main stage musical Fiddler on the Roof feels like a bit of a change from recent fare. The last few shows (Joseph, Bye Bye Birdie, Xanadu) have been very high energy, fun, almost campy musicals. It's been quite a while since I've had a tear in my eye at the Chanhassen, but I did on Friday night. 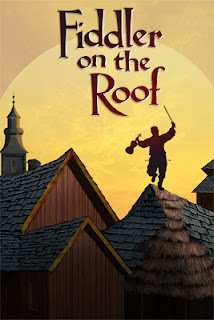 Tevye, the main character in Fiddler, has such love for his family, his traditions, and his village that when those things begin to be broken apart, you can't help but be moved by it. Don't get me wrong, there's still plenty of humor and great dancing (although of a different kind than the usual Broadway style), but this show has more of a deeper meaning and serious undertone that we've seen recently at the Chan. But what hasn't changed is the excellent cast of regulars (and a few newcomers) directed by Michael Brindisi, the fantastic onstage orchestra led by Andrew Cooke, and the high production values. This is a great production of one of the most popular musicals of the last century. At the heart of this production is Keith Rice as Tevye. He's long been one of my favorites at the Chanhassen, often hamming it up in a comedic role (such as his recent turn as the Pharaoh in Joseph), but this is the best I've seen him. He still plays the comedy in Tevye's friendly kvetching about his troubles as he talks to God (and the audience) like an old friend, but there's great heart there too. Keith possesses a beautiful rich baritone with which he can bring down the rafters, but he shows incredible restraint in "If I Were a Rich Man," pulling it in and making it a sort of conversational rumination on a daydream. 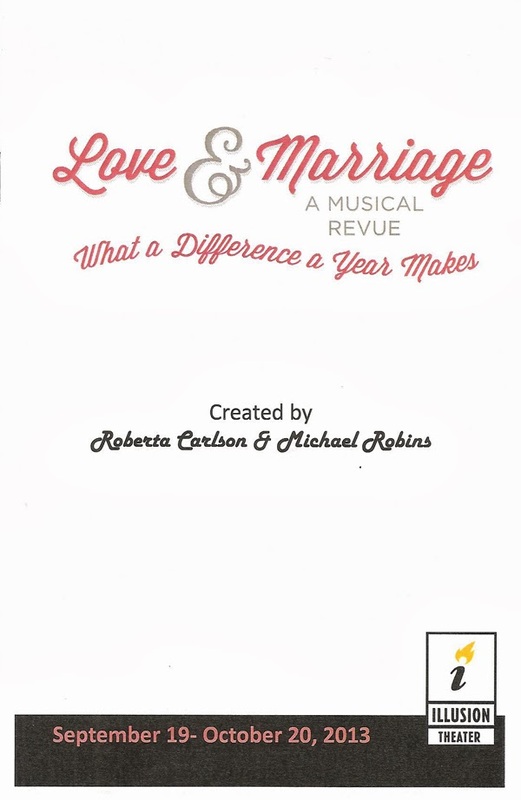 Michelle Barber is a good match as his wife Golde, and they share a comfortable chemistry, especially in the sweet song "Do You Love Me?" The three daughters are well cast; they're charming, strong singers, and embody the different personalities of the girls (Serena Brook, Ruthanne Heyward, and Caroline Innerbichler). Also great and well cast are the men playing their suitors (Zachary Colton Schaeffer, Jared Oxborough, and Tyler Michaels**). 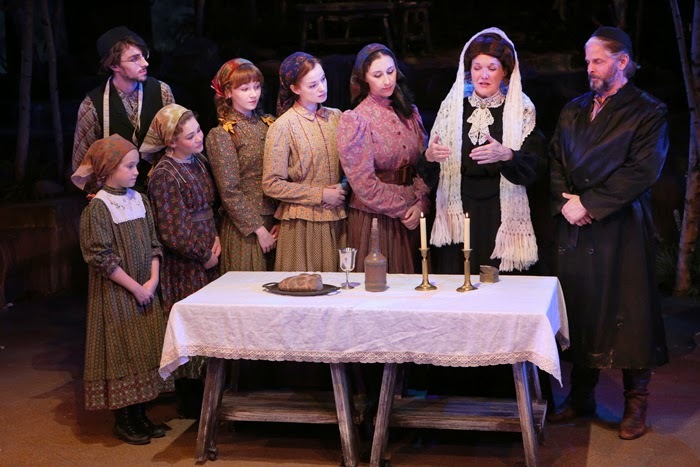 The large ensemble provides great support, and Mary Sue McDonald is the titular Fiddler, who seems to represent Tevye's soul, always there at important moments. 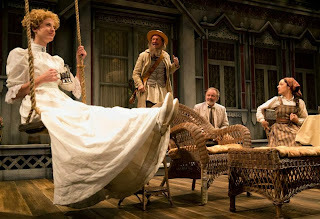 The costumes (by Rich Hamson) are excellent and authentic-looking, and I couldn't help but think how hot the actors must be under the layers of coats, shawls, skirts, boots, hats. A fortunate story element - according to tradition everyone must keep their heads covered - eliminates the need for unflattering wigs. In addition to the muted everyday wear, there's also an opportunity for fun and colorful costumes in a fantastical dream sequence. The choreography (by Tamara Kangas Erickson) features some thrilling Jewish and Russian-style dancing, and the well-known score includes such favorites as "Tradition," "Matchmaker, Matchmaker," and "Sunrise, Sunset." I wasn't that familiar with Fiddler before seeing this show, having never seen the entire 1971 movie and only having seen it onstage once before (pre-blog, which means I don't remember much about it). I found it to be a great musical about faith, family, tradition, resilience, and community. Head out to Chanhassen between now and February for something to warm your heart (and stomach - some great new menu items) this winter. 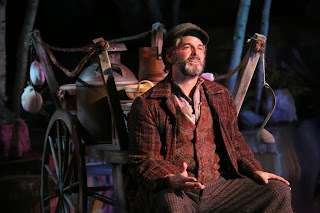 *If you want to know what happens to Tevye and his family upon immigrating to America, go see Theater Latte Da's Steerage Song, a new music-theater piece about the European immigrant experience in the 19th and early 20th centuries. **Tyler Michaels is playing the role of Fyedka through Dec. 8, at which time he leaves the show to play the emcee in Theater Latte Da's Cabaret.